Dunkin' Donuts To Drop "Donuts" From Name - Joe.My.God. Starting in January, Dunkin’ Donuts will drop the “Donuts” from ads, packages and signage at new and remodeled stores, as well as its social media accounts. 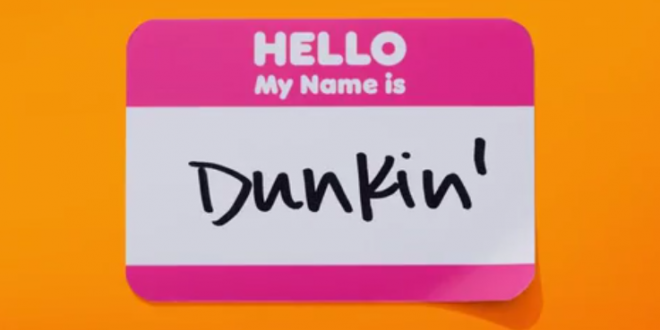 The makeover is part of Dunkin’ Brand’s efforts to relabel itself as a “beverage-led” company that focuses on coffees, teas, speedy service and to-go food including -— but not limited to — doughnuts. Dunkin’ says that beverages, especially coffee, make up 60% of the company’s US sales. “Our new branding is one of many things we are doing as part of our blueprint for growth to modernize the Dunkin’ experience for our customer,” said Dunkin’ Brands (DNKN)CEO David Hoffmann in a statement Tuesday. Kentucky Fried Chicken became KFC in 1991.